[New for early 2015] Let's not beat around the bush here, this all natural ice cream is what ice cream should be. You know what I hate most about frozen dairy desserts? Sure it's cheap and often low cal & low fat, but it's gummy and full of food science. The thing that drives me truly nuts though? It's warm. It doesn't hold the cold like the ice creams I remember as a kid. From the very first bite of this one I thought "wow that's cold". Think I'm crazy ? Well, I am, but try it some time and you'll see what I mean. Now, on to the reviews! Preparing to make a breakfast sundae. I just finished my first cup of the chocolate chip ice cream and it hit the spot. I love simple ice cream. It's why I adored Breyers as a kid. It's just this cold awesomeness that's all chilly and clean. I don't want to be clogged up with gums and emulsifiers and whatever else. I'll take this over any mainstream chocolate chip flavor any day. If I wanted to nitpick, I could say they it could use a smidge more vanilla flavor. I'd love this to be vanilla bean chocolate chip, but honestly, that's a nitpick. The chocolate chips have this nice dry thudding crunch to them and they are oh so plentiful. There seemed to be several in every scoop. Lastly, I love the way a simple ice cream melts. At first, it may not be as smooth and creamy as you expect, but it's actually surprisingly easy to scoop and it melts pretty quickly. You know what we do when it gets soft right? We swirl it up and make a nice soft serve like treat. I pretty much just inhaled my first scooping. I think Turkey Hill should drop what's left of their Stuff'd frozen dairy dessert line and just focus on this all natural stuff. I want clean and crisp. I want a second scoop! Alright, I was about to grab my sunday morning chocolate milk (it's a think I do, don't ask me why) when I decided to grab the chocolate chocolate chip ice cream instead. I take a few bites and I think I made the right call. I think some people might be thrown off by the chocolate chips at first, they're a bit atypical, but there are just so many of them that they grow on you quickly. So many chips makes it a little hard to describe the base. Let's put it this way, it's a fine middle of the road flavor. No funkiness, no overt dryness, nothing odd. I'm still digging the easy melting, old school texture. It's funny how easy it is to scoop, or the fact that it kind of breaks instead of stretching like some gum riddled alternative. I know it won't be for everybody, I've been through several (old school) Breyers grit vs Edy's creaminess to know that we're all different, but for me, this is what I prefer. I've been a huge fan of turkey hill's all natural various product lines since long before I started the blog and I don't see that stopping anytime soon. The only real complaint recently is that there haven't been enough choices in the lineup and they're working on that now. The only question left is: where are my fruity all natural flavors? P.S. Dear Turkey Hill, my wife would love some cookie dough in the chocolate chip flavor. On Second Scoop: Yeah, these two are totally hitting the spot this week. I'm back in the 80s and enjoying every scoop. If you youngens want to know why all us old folks are angry about Breyers frozen dairy desserts, just try one of these two flavors and compare it to their new stuff. These new flavors will make fine rotational stock in our freezer when I don't want something crazy or overpriced (or fake). I totally know what you mean Dubba! I remember the Breyer's of my childhood and I think that's where my love of ice cream first began. I too love TH's All Natural line, specifically their Salted Caramel, so I can't wait to try the Chocolate chocolate chip! Grammar police on the alert - Your portion of On Second Scoop says "there" a few times. It should be "their". You also wrote "too scoop" instead of "to scoop" but great review. Looks delicious! Frozen Dairy Dessert is just repulsive. I'm sorry this blog doesn't make money, it should! If it helps any, I love the blog and appreciate it very much. I just re-read the review and. I found "their", "there" and"they're" all used CORRECTLY within the paragraphs above! Remember "their" is the one that refers to a possession. The other two have different uses. @Leslie: no binders or gums holding this one together, just a handful of ingredients. It's definitely not the smooth/"creamy" texture you might get from say modern breyers or Edys (or the density you might get from a super premium ice cream). reminds me of 80's style breyers. Hey dubba, thanks for the fun read. Breyers and Turkey Hill both now have split into two lines; they each have a "natural" line and an artificial line. In both cases, the artificial line tastes pretty terrible. But it seems to me that even when comparing the natural offerings, Turkey Hill tastes vastly better than Breyers. 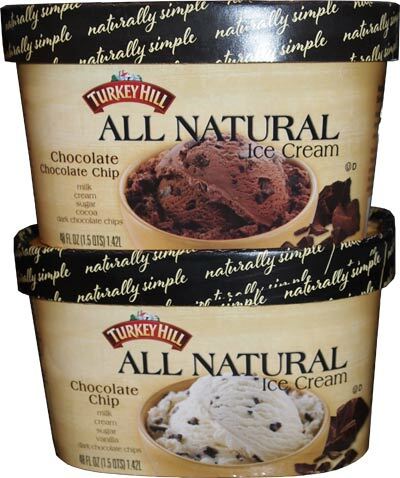 We recently bought a carton of Breyers natural chocolate/vanilla combo, along with a carton of Turkey Hill natural chocolate chocolate chip (the one you review here), and They Turkey Hill natural chocolate chip mint. Both of the Turkey Hill offerings were fantastic...really bright and fresh tasting with fairly intense flavors: a strong clean mint, and very deep cocoa flavor to the chocolate. The Breyers was bland and uninteresting. It's also interesting that neither the Breyers nor the Turkey Hill is particularly creamy. As you mention, the Turkey Hill sort of breaks apart and crumbles a little bit (due to larger ice crystals? ), but i'm surprised to find that I actually really like the texture. The Breyers doesn't quite share the same crumbly quality, but it's certainly not creamy either. The Breyers is just bland. @Mike: hi! thanks for all the thoughts! both Breyers and Turkey Hill have greatly expanded since their earlier days of just offering half gallons of true ice cream. the breyers "all natural" stuff is just a sham marketing effort to bring back all the loyal customers they drove away. if you look closely, most of their black containers are frozen dairy dessert, not even ice cream, you just happened to pick up one of their handful of flavors that's still "ice cream". [they also have the blasts line up which are pretty much all frozen dairy dessert]. 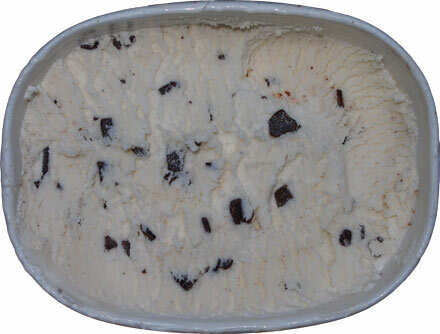 did you have the misfortune of picking up one of turkey hill's frozen dairy dessert products? the line is limited but I do recommend people avoid them. Oh, and old school breyers was never particularly creamy, at least not that I remember. it was just clean and cold and I loved it. If you really wanted it creamy you could smush it all together. Thanks for writing, I hope you stick around! This si my first review ever. I'm very disappointed to notices that the "recipe" has chaged, with larger chocolate chips, more of them,and milkier. I tried Turkey Hill all natural ice cream for the first time today. I was at first a bit apprehensive, as I had had tried Turkey Hill "normal" ice cream in the past, and while many words could be used to describe it, "ice" and "cream" were not among them. This, however, can be described with just one word... perfect. This is as good as Bryer's USED to be. Granted, it's expensive, as a half-gallon of ice cream now comes in at 48 oz. But you're getting 48 oz. of actual ice cream, not 48 oz. of frozen chemical salad. Chalk this one up as a winner, Turkey Hill. Recommended without hesitation. out of curiosity, was it their regular ice creams you didnt like or did you have the misfortune of trying one of their frozen dairy desserts (the dwindling Stuff'd lineup)? It was the regular ice cream. Or should I say the regular "ice cream". That stuff doesn't even MELT. Leave it out on the counter, and two hours later it looks exactly the same as it did when it started. Love seeing the comments regarding "the old Breyers Ice Cream". I loved how much vanilla bean was in the vanilla, it was unlike any other ice cream out there; of course at that time it truly was All Natural-- Breyers used the line about it only having five ingredients. It's a shame that money and profit margins became involved. I recently saw the commercial about Breyers vanilla bean being natural once again, all I can say about that is "check the ingredients"---I haven't found one like that in the Breyers ice cream line in twenty plus years. Ok, important stuff, Turkey Hill All Natural Vanilla Bean is wonderful. It is exactly as you describe. I found it a few years ago, first in only two or three favors, that has since grown. I recently grabbed the homemade version of All Natural Vanilla;I didn't care for it but I believe that is because of my love for vanilla bean. For the people wanting creamy, old fashioned, homemade vanilla---this ice cream is for you! I prefer my sharp, clean vanilla bean taste. If you get the chance to try the Raspberry-limited batch--it is very, very good! The mint chocolate chip is great as well. I hope they continue to expand this line and I would appreciate if the big box stores in our area would begin stocking this product!! Kudos to Turkey Hill. It's a great ice cream for floats. Turkey Hill: NONFAT MILK, CREAM, SUGAR, VANILLA, VANILLA BEAN. Breyer's: MILK, CREAM, SUGAR, TARA GUM, VANILLA BEANS, NATURAL FLAVOR, NATURAL VANILLA FLAVOR. Join us on the non-gummy side! I found this brand of ice cream to be too airy (like Breyers) and the taste to be too muted for me. you insult it by comparing it to modern day breyers! I do not care for ice cream filled with synthetic chemicals or even natural fillers, like carob bean gum. So, when I saw a "new" brand of a natural ice cream in the store this week, Turkey Hill All Natural Homemade Vanilla, I was excited. I now realize it is not so new, but it is a brand I had not seen before. Unfortunately, I cannot share your enthusiasm for this brand. The vanilla may be natural, but the flavor is off. I can't explain what it is, perhaps it is somewhat "fruity." But, it lacks what I would expect to be a classic vanilla flavor. This is disappointing because there are truly few options for moderate cost natural ice cream. We have used Blue Bunny for some years now - ever since we discovered that Bryer's All Natural had ingredients other than milk, cream, sugar, and "natural" flavor: to wit: tara bean gum (!!!). Probably the best relatively inexpensive natural vanilla ice cream that I ever had was Pierre's. It is a local brand in Cleveland. (https://pierres.com/). It's been 30 years since I lived there, so I don't know if they still have a natural version of vanilla. (It was actually their French Vanilla that I preferred.) Of course, there is no shortage of really good vanilla ice cream, if you are willing to fork over the super premium cash for the super premium ice cream. HD and Trader Joe's have really good vanilla ice cream. However, the best of all is another local brand: Chocolate Shoppe ice cream (http://www.chocolateshoppeicecream.com/). There is a Chocolate Shoppe store just six blocks from our house! But "super premium" also means "super fat." Ever mindful of its artery-clogging properties, we indulge in this variety only on very special occasions. 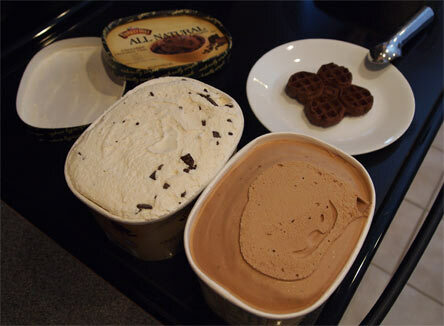 Finally, for those interested in a super massive ice cream taste test, you may find this web page to be of interest: http://tastetestersclub.blogspot.com/2013/05/best-ice-cream-in-u.html. Just to be clear, I have no connection to any brand or website mentioned in this post. I just like really good ice cream that is all natural. @Abe: first, that giant "$18000" ice cream "rankings list" is bupkis, but let's forget that and talk Turkey... Hill that is. If a strong french vanilla is your thing then I can see why the mild all natural turkey hill didnt live up to your expectations. I would recommend giving it a second chance. I know the lineup isn't huge, but the (vanilla) chocolate chip is my favorite and there are four more flavors coming out this year. If you want a straight up awesome vanilla, I would recommend tracking down a pint of Three Twins version. I used to rank it almost as good as Graeters version, but recently Graeters has "trimmed" their quality down a bit. I mention it in particular because it's both organic but not super heavy like H-D and B&J. With any luck you can find it for $3.99 a pint though that still might be a little more than you want to pay. Good luck with your quest. @Abe: ahhh, didnt mention kosher before, just all natural. I have not done a side by side with the TH vanilla bean and homemade, the homemade is newer but I havent had the chance to bring a container home yet. blue bunny isnt all natural unless you are talking about the froyo, which isn't all natural anymore either. just curious which variation you are talking about. sorry, the whole list in general is annoying. let's compare 117 things even though the only thing they have in common is that they have chocolate in the name. here, let me rank this chocolate milk versus this chocolate chip and hope you accidentally click on this link because i've used as many keywords as humanly possible even if half my info is wrong. A little harsh but you get the idea. If you don't like that answer, than consider the fact that they are giving terrible grades to good products. Having done this for almost 9 years (and eating ice cream at least once a day for most of my life), I look at that list and realize it's terrible. Actually, it's offensive. But opinions are opinions. Not everyone agrees with me either. Chiming in to say I'm glad you've left this thread up. I've just encountered Turkey Hill's All Natural line, loving it, and wanting to make sure Turkey Hill feels the love and keeps it going, googled over to here. Like you and many of your posters, I'm still hurting from the big Breyer's change-over/betrayal. Any news on sales figures or correspondence with Turkey Hill? This is what ice cream should be and it's great to have a cheaper option. Your point about the "Tastetestersclub" review site is well taken! As for Blue Bunny, I was talking about their Vanilla Bean variety, which, I believe, is the only variety - alas - that has all natural ingredients. You can find it here: https://www.bluebunny.com/flavor/vanilla-bean. the only ingredients are Milk, Cream, Skim Milk, Sugar, Egg Yolks, Natural Vanilla Extract and Vanilla Bean Specks. No fillers, no stabilizers, no emulsifiers. What is on the website matches what I see on the label on the ice cream in our freezer. However, they call this "Premium" ice cream. That is quite a stretch, given how much air is whipped in and the low fat content. @Abe: good catch! I kept visualizing the old "all natural vanilla" they had with the black label at the bottom. I wonder why they dont point out the simple ingredient list, are they afraid to make their other products look bad? I was thinking the same: that they don't wish to highlight the difference with their other products, which are filled with all sorts of additives. We used to buy the old "All Natural" product, which was exactly the same as the Vanilla Bean I mentioned. That product disappeared for a while, and then the repackaged version appeared. Their taste is identical as no changes were made to the ingredients. But, it is very odd that they label this "premium." Apparently, there are no FDA standards on the use of "premium" in ice cream labeling. See https://www.ecfr.gov/cgi-bin/text-idx?SID=e98ce20198b412ce003101d325ed64d7&mc=true&node=pt21.2.135&rgn=div5. One other issue that should be addressed is "overrun." Surprisingly, I thought the overrun of the TH ice cream was greater than that of the Blue Bunny. However, after I checked, I learned that by a 1 gram difference, it is the other way around. Finally, I tasted both side by side. Now I see why you say that TH has a clean taste. Actually, that taste has been growing on me. For the price, it is a reasonable alternative. At some point, I will want to taste the TH Vanilla Bean side by side with the "Homemade" variety they make. All the best. @Abe: yeah, it's pretty annoying how they (not just blue bunny) abuse the "premium" tag nowadays. Friendlys is another one that does it and it drives me nuts because their quality is distinctly lower. Our only hope is that they learn the error of their ways (or just give up and spend more money). I'd prefer the first one. That salted Carmel is about the best thing I've ate I grind up mixed nuts real fine for texture and throw in with it best thing ever. Ive been eating Turkey Hill All Natural Chocolate chip and mint chocolate chip ice cream every night for almost a year now. Ive never tried heroin but if I was addicted to it I would start eating this product every night instead because it would be a much cheaper alternative. I tried blue bunny once and it gave me diarrhea - not joking. Turkey Hill - please do not change this recipe. It is as close as I can get to heaven on earth. 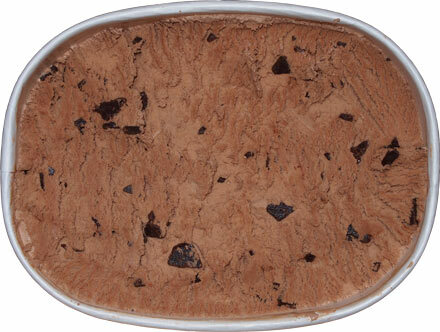 I grew up with Breyers chocolate ice cream, it was simple perfection and absolutely delicious. I remember sometime around 2004 opening a carton to notice the taste was off. I honestly thought it had gone bad and went out to buy another carton, I never imagined they'd be so callous as to change the time-honored and loved recipe. When I realized the second carton was just as bad I finally took a look at the ingredients to learn they'd been corrupted with gums and other crap. I couldn't believe it. It took a while until I discovered Turkey Hill, but once I came across their all natural chocolate chocolate chip I was hooked, it's excellent. It's a bit denser than the original Breyers, but it's crazy good. Plus it has great cocoa tasting chips with just the right sweetness and biteability- when I open a carton I can't allow myself to eat from it and have to scoop it into a bowl- otherwise I just keep eating. Especially when the outer edges begin melting- I'll take the spoon and scrape it along the perimeter to catch all the soft edges as it melts. I can't express how grateful I am that Turkey Hill allows me to still enjoy the kind of high-quality, all natural treat that ice cream is supposed to be. Thank you Turkey Hill.